So I decided to spare you a post with someone else’s photos about an event that I didn’t even go to. But while everyone else was frolicking on the beach sipping tiki cocktails with their favorite chefs, I was at home, reading. One thing that caught my eye in the newspaper was an article about Bobby Flay – who often appears on television and probably gets to go to those food festivals – regarding a new restaurant he is opening in New York after a hiatus from restaurant cooking. Unlike writing about faux vacations, I was much more intrigued by a recipe for Chicken with Roquefort cheese that accompanied the article. 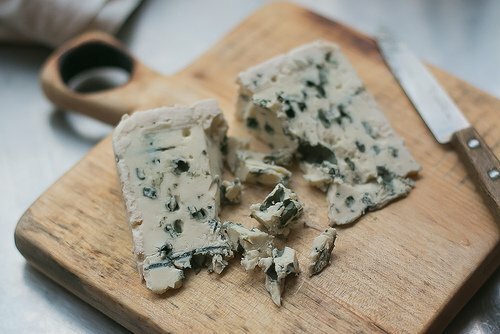 So I went to the market and came home with a big hunk (unfortunately, not the guy from the Auvergne who sells sausages and terrines, with the dreamy smile..) of the blue-green veined cheese that happens to be the first AOC designated food in France. It remains one of my favorite cheeses and it’s hard to find a bad example of it in France. One thing, though, that is hard to find are bone-in chicken breasts. There are whole chickens, plenty of thighs and legs, and boneless breasts aplenty. But I’ve never seen a bone-in chicken breast in Paris, so decided to go with their more flavorful counterparts; the leg and thigh portions. You could tell the recipe was a “restaurant recipe” because it called for a lot of butter. I don’t have a problem with butter, but a whole stick (115g) mashed together with a generous chunk of Roquefort, created pretty unappetizing leftovers: the butter had firmed up in the container into a deep, waxy, yellow pool. It reminded me of the time I bought beef bones to roast for making stock. I pulled out the marrow midway during the roasting and let it sit in a bowl, thinking I would go back and eat it later. But it had solidified into a rather uninviting mass, and I’ve only been able to eat marrow once since then. I don’t want to give up on butter entirely, so I became one of those “swap it out” folks, and decided to rework the recipe from the ground up. Romain was skeptical about the combination of blue cheese and chicken, but stubbornly, I felt it had merit. And no, it was not just for the sake of an argument. Neither of us is that French, although he used to be (before I got my hands on him). Like us, in spite of different origins, fruit and blue cheese have a particular affinity for each other, I was convinced. So I took a page from what is often called Wine Harvester’s Chicken, a dish that is made with sautéed grapes stewed with the chicken, to make a sauce for the my variation of Chicken with Roquefort. 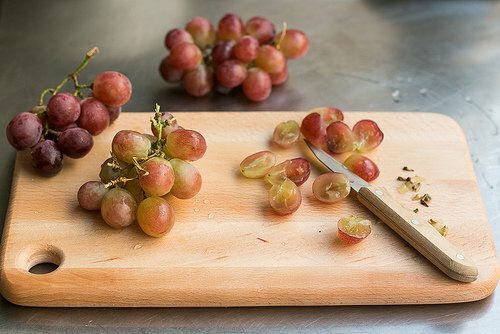 A good lesson why you should cook seasonally, and not necessarily start with an idea in your head – then try to find the right ingredients – was that there were no luscious, juicy-ripe wine grapes available anywhere, so I bought what they had at the grocery store. (The other lesson, as I later found out, was not to be so stubborn.) I dutifully seeded them all, figuring that I would reason with you that even though seeding grapes is a pain, at least I wasn’t going to ask you to peel grapes. (You’re welcome.) And that the results would be worth it. In the end, the results weren’t worth it and the dish was so-so and not an improvement on the original recipe. My variation just wasn’t doing it for me. I wanted that rich, juicy grape syrup mingling with Roquefort cheese which, like my imaginary vacation on the beach, didn’t quite happen. There was that delicious, tart-sweet gastrique that was part of Chef Flay’s original recipe, meant to be spooned over the finished dish. It was so good it made me swoon. 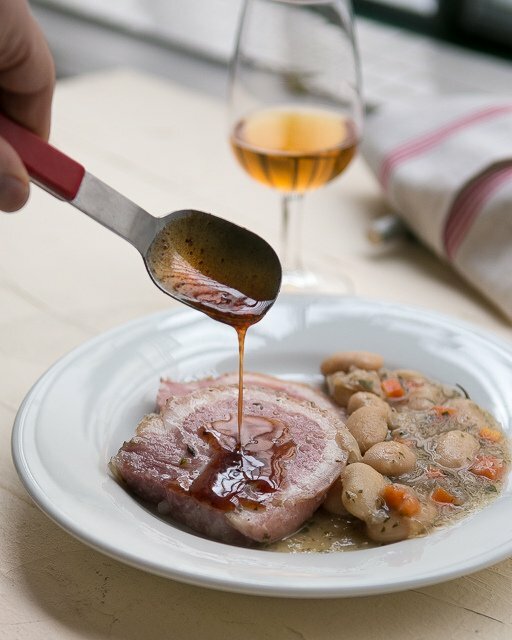 So when I simmered up a pot of heirloom beans and jambonneau (both gifts from my friend Kate, the beans grown by her neighbors), a little aigre-doux, or sweet-sour sauce, proved just the right thing to spoon over it. 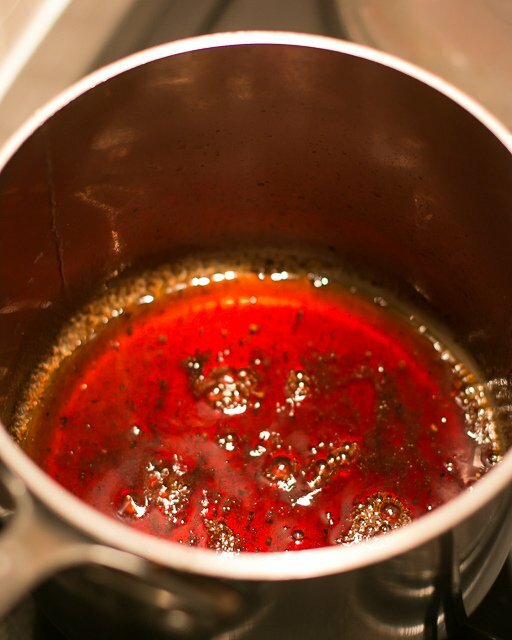 The base of gastrique is sugar or honey with vinegar, but you can find versions with a handful of berries, or a spoonful or two of fruit puree, added at the end of cooking. I kept it simple because it was so good just as is. (I learned my lesson with the chicken dish. And perhaps listening to my Frenchman.) But you can certainly test your own creativity (and relationship) and add a dash of whatever you wish. If meat isn’t your thing, I imagine it would be equally outstanding spooned over roast winter squash for a vegetarian main dish. 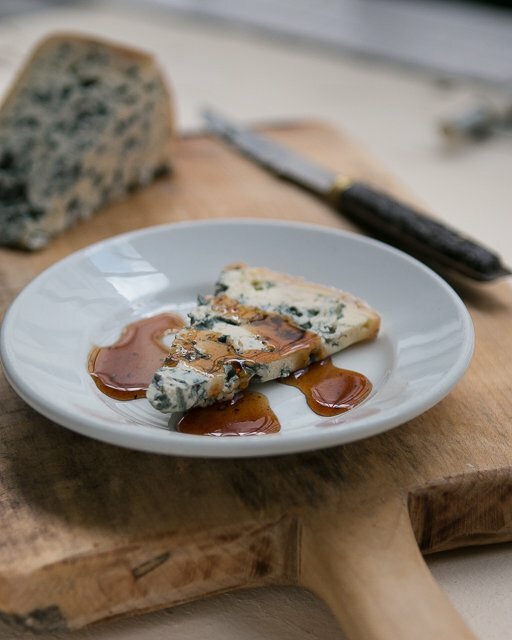 Or to finish off a meal, it can be spooned over cheese, such as a pungent blue or Roquefort, which I found was a great way to use up the rest of the cheese, as well as the delectable gastrique. 1. Heat the honey in a small saucepan over medium-low heat for 5 minutes, until it becomes a noticeably deeper shade of brown. 2. Add the vinegar and continue to cook, swirling the pan a few times, for about 15 minutes, until the sauce has thickened to the consistency of thin maple syrup. 3. Remove from heat and add a good pinch of both salt and pepper. Serve warm over roasted or simmered meats, or vegetables. Or let cool to room temperature, if serving with cheese. Storage: The gastrique will keep for up to two weeks in the refrigerator. Let come to room temperature, or gently reheat, before serving. I guess if this were a Bobby Flay throw down you would have won! Thanks for post and including the links about gastrique — Martha Stewart’s pomegranate gastrique looks good too. Did you give a link for the beans and jambonneau from Kate — I would love to try that dish to go with your gastrique — it looked delicious! There’s no link to the beans with jambonneau. I just simmered the beans with some water and chopped carrots, onions, thyme branches and bay leaves. 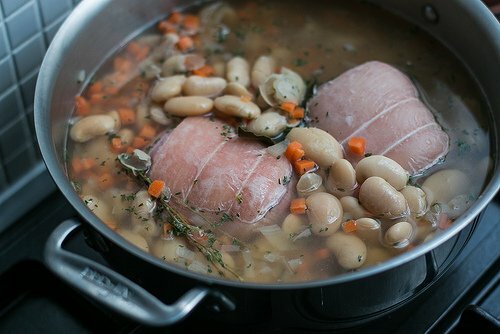 Then when they were close to being done, I added the jambonneaux and simmered until it was warmed through as well as a handful of chopped parsley. I want to lick that drizzly gastrique spoon. I admit, sheepishly, to watching those abominable cooking shows and have always wondered what a gastrique was. Now I know! I wonder, could you make this gastrique with cherries? I had a fabulous pork loin with a sauce that tasted like sweet/sour which might have been vinegar/honey and it had sautéed cherries. It was fabulous! Thanks for educating me so early in the morning. David. Could you use a very high quality Balsamic? With a small bottle of authentic balsamic (aged at least 12 years) starting at least $30 or more, I wouldn’t recommend it for reducing. It’s great – and precious – stuff on it’s own, though! This is one recipe where a more tart vinegar like regular old (often treated like a poor relative) cider vinegar plays off well against (ordinary) clover honey. There are other uses for balsamic vinegar and exotic honeys. I don’t believe this is one of them. This could be very good drizzled over our (too lean and now tasteless) pork. I wish I’d thought of that last week! ClaireD, thanks for educating me. Wish I’d thought of gastrique with cherries last week when I had some relatively tasteless pork tenderloin. I had this ridiculous currant gastrique at a local restaurant a few months ago, served with this foie gras tarte tatin. 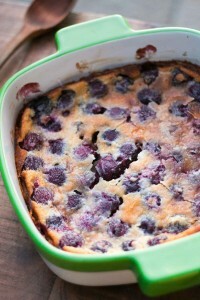 I’ve been dreaming about it ever since, and may need to try and recreate it using your recipe as a base! Hey, does that make hot honey-mustard un gastrique of sorts? Have I told you lately that I love you!! I’ve preordered your new book on Amazon and can’t wait for it. Adrian and Esmee: Well, Bobby Flay and those other chefs are big stars and on television, and draw in lots of guests. So it’s great (and they’ve worked hard to get where they are) that they get to go to those places. However I have to say, I get a number of pr things in my Inbox (and I count several publicists amongst my close friends..) but when I read that someone was asking me to write about a trip and publish photos on a trip that I never went on, my jaw dropped. And it still hasn’t recovered..! 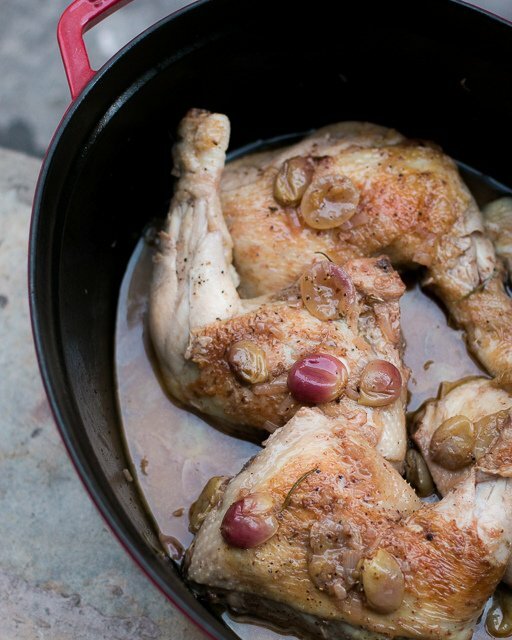 Try this fabulous chicken recipe w/ a “grape sauce” that’s out of this world. From Chef Michael Chiarello. Puree the grapes in a blender, then strain through a sieve, pressing on the solids to extract as much juice as possible. You should have about 2 ½ c of juice. Set aside. This is more than I usually do for a recipe, but it is SOOO worth it. Preheat the oven to 400°. Season the chicken on all sides with salt and pepper to taste and the fennel Spice mixture. Heat a large ovenproof skillet over moderately high heat. When the skillet is hot, add the oil. Add the chicken breasts, skin-side down, and brown well on all sides, about 7 minutes total. Transfer the skillet to the oven and cook until the chicken is done through (test with a knife), 12-15 minutes. Transfer the chicken to a serving platter and pour off all but 1 T of the fat in the skillet. Add the shallots to the skillet and return to moderate heat. Cook until softened, then add the rosemary and cook briefly to release its fragrance. Add 2 c of the grape juice and simmer briskly until reduced by half. Add the stock and any collected juices from the chicken platter and simmer until the mixture has reduced to a creamy, sauce-like consistency. Add more grape juice if desired. The total volume of the sauce will be a little more than 1 cup. Spoon the sauce over and around the chicken and serve immediately..
Pour the seeds into a blender or spice grinder and add the salt. Blend to a fine powder, shaking the blender/grinder occasionally to redistribute the seeds. Store in a tightly sealed glass jar in a cool, dry place, or freeze. David, You are awesome! I had just been thinking that if anyone could talk about a gastrique, it would be you and I thought I’d write to ask. You latest post was perfect, as they all are. I devour every one of your posts and chuckle at the asides which are always a delight. Thanks so much! David, I think 160g honey is 1/2 cup. How much honey is in the recipe? Why wouldn’t gastrique keep indefinitely? Honey and vinegar both do. I’m going to make this today to drizzle over bacon wrapped bleu cheese stuffed dates. Yum! First things first. I have no beach, but there’s a Wally’s World up the road. I’ll buy a kiddy backyard pool, pull out a plastic web chair, or two, and entertain both you and Romain with one of my several personalities. I’ll order California wine, grab some vittle fixings at Central Market and serve you two at poolside. I’m going for your version sidecar as my choice. Who in their right mind leaves you out of an excursion and then presents you with presenting it? Oh never mind. I’m old, grouchy and I don’t care for pretentiousness or grandiose on an scale. I absolutely enjoy honesty and integrity. But number one, by far, I love class! What color of pool should I get? 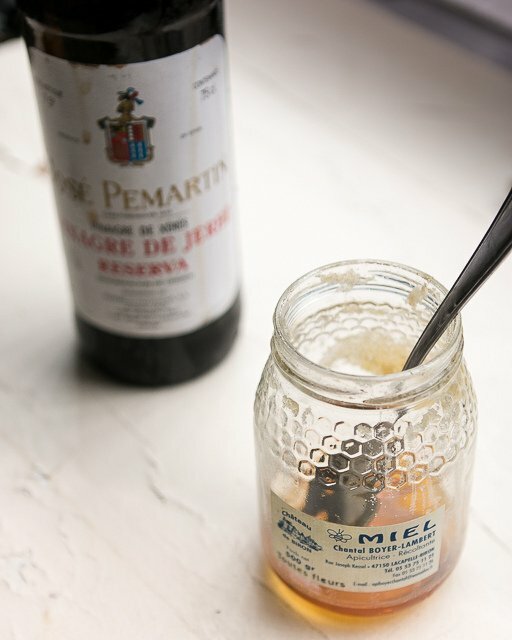 i’m still intrigued by the grapes and roquefort concept so hope you’ll go back to it one day – as i munch my toasted olive bread with apricot jam for breakfast which seemed a similarly doubtful combination tip i risked it! love the simplicity of the gastrique. Tiki cocktails with warm sand between your toes so over-rated compared to life in Paris, with dreamy Auvergne guys at your local market (yes I have one at mine too; Marche Saxe-Breteuil) and gastrique on your cheese – thank you for the post. I am new to your blog and am really enjoying discovering Paris through it, especially your pastisserie related stuff. I was just reading through your recent posts of macaron especially, and between Herme (fabulous) and Laduree ( not as good and they are also often snooty in their stores – so rare in Paris, no?) I found that my favorite, in the 15th, is missing – Sadaharu Aoki. Maybe the flavors are not as exotic as Herme? Anyway a bit of a tangent from chicken and gastrique, sorry, but for me his are the best, that I just had to mention it! I most definitely suffer from a far too exuberant imagination – I read your article twice already and all I see is ‘gastritis’….. – how on earth can anybody come up with such a name for something so obviously nice and therefore spoil it for peeps like me. First I thought you wanted to warn us from a stomach bug…. honestly. Such a pity; because when I finally got over the shock and looked at your post, I found those wonderful photos. And since I have a rather largish leftover chunk of Bleu d’Auvergne, I am intruiged by your idea – I can see it working just beautifully. Thank you so much for all the trouble. 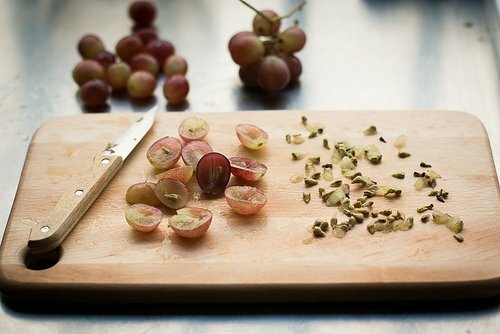 We noticed last time we were in France that you don’t seem to have the seedless grapes we do. Brie (a decent Brie, not the tasteless sort you so often find in British supermarkets) and black grapes makes a sandwich to die for…. David, thank you for this: I have some outstanding plum cider vinegar and some local honey and now I know how to make gastrique. I also have a little bit of gorgonzola sitting around (wrong country, wrong cheese, I know). So simple — I like simple. red wine; reduce by half in roasting pan. Add 2 lbs. parboiled sausages nestle them in. the key is add 3 T balsamic vinegar then reduce. Yummy, not sure if gastric but…. Btw been keeping an eye on your schedule and signed up for your class in Dallas April 23. My daughter and I will be there! We’re looking forward to it. thanks for the recipe ….saw it in the NYTimes, but forgot about it….FYI…Bobby Flay’s spread in Bon Appetite is pretty darn good. I would love to see you on American TV. The Food Network is almost a lost cause, but a show on Create/PBS, would fit you perfectly and vice versa, because you are such an interesting chef and baker. Et aussi; I understand Romain perfectly! I just talked with Central Market in San Antonio and they said you were not coming here to promote your new book, My Paris Kitchen. So disappointed you will not be in San Antonio, but you must have a very busy schedule — next time! Thank you for such and entertaining and educational post! 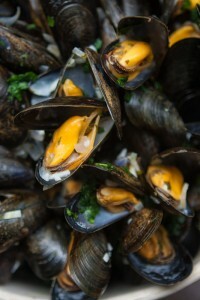 Gastrique has always mystified me – it sounds odd, and yet tastes divine. I appreciate the many suggestions on what to do with it! I also enjoyed your comments about celebrity chefs and food festivals; not taking oneself too seriously is a secret to true happiness, it seems. I love recipes that don’t take a week to prepare (although my pears are soaking in wine day 5) and are straightforward. 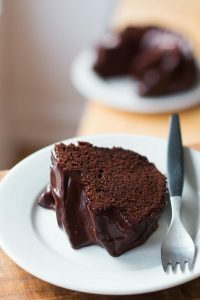 Great recipe, and thanks for the extra one in the comments- how could you tease us with a photo like that!! Well thank goodness gastrique is a sauce, when I first saw the title I thought you had been laid low with gastric flu or some other lurgy! Oh no when I saw your heading “Gastrique” I thought Daveed ees sick! On further reading, I realised the contrary: Daveed is right on form, if not a bit frisky at the moment non. Your blogs keep me so entertained and always make me laugh. And of course the recipes and your journey/s to perfect them are also fabulous and delicious. Like many others I thought, mon dieu, pauvre David has been struck down by la grippe intestinale! It says a lot that I still wanted to read about it! Fascinating post (and I’m glad you’re in good health). Just saw that your My Paris Kitchen is “Cookbook of the Month” in the Canadian House & Home magazine, April edition. It’s in the section called Food News, Ask a Chef and there’s a picture of the book’s cover too!!! Good for You! Thank you for the fun read, great photos, and recipes but my eyes bugged out when I spied your spoon; is that an Abert spoon? I’ve been searching for those since the 80’s. Such a fun read today. My goodness, you were having fun from the first reference to the cheese and sausage vendor all the way through to the end. Fun! FUN! FUN!! !